Description: Rosie the hen goes for a walk around the farm. Little does she know that there is a fox following her. Why I like this book: The story is simple, and kids love it. Great pictures, and simple humorous ending. Use “Braidy” (www.mindwingconcepts.com) for a simple sequence story to have kids retell. Use the pictures in the story, and have kids be “the teacher.” Encourage temporal markers: first, next, then, last. Practice prepositions. Have kids “act” out what Rosie does. Have a toy hen (or have them be Rosie!) and have them walk around, through, under, over. Use props. 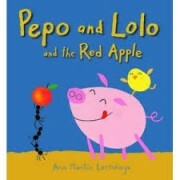 Please support books4all and order this book from Amazon.com . Thank you! 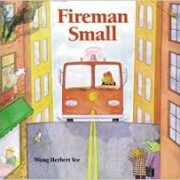 Description: One tiny firefighter works hard all day to help his friends when they are in trouble. Why I like this book: The catchy rhyme in this book grabs kids’ attention and the simple plot line is great for inspiring dramatic play. The problems related in the story have rather obvious solutions so this is a great book for introducing the idea of problems and solutions within a story. This book can also be used to introduce the category of community helpers. Discuss the different roles that each community helper plays in our community and then play a round of the Bag Game to reinforce those concepts. The narrative structure of this story lends itself very well to use with the Story Grammar Marker App. Have kids retell the story with particular focus on the “kickoff” (initiating event) for each problem, the accompanying emotion, the “plan” and the resolution. This is a fantastic story for promoting group pretend play. Using small people figurines and dramatic play materials, the kids can set up a fire station and props for each of the story components. Kids can then take turns with each of the characters. Kids can also act out the story with themselves as characters and gross motor materials as props. Acting out the story in this way provides a wealth of opportunity to experience movement, deep muscle input and tactile sensations. Using a scooter board or platform swing as a fire truck, a soft barrel as a well and/or a climbing pole as a tree provides lots of different sensory input while fostering representational ideation and play. Fireman Small’s friends really appreciate him. Use this story to talk about thanking friends when they are helpful and how good it feels when we help others. Social Thinking Behavior Maps provide a great visual aid for talking about the connections between our actions and our emotions. Description: A little girl leaves her sled outside at night, and realizes that she is sharing it with many forest animals! Why I like this story: This story was recommended by a good friend (and also People Magazine ;)) and has been a hit with so many children. It’s mainly a wordless book with adorable illustrations. Have children be the “teacher” and read it to you. Encourage temporal markers (first, next, then) and expanding on their language. Would be great to incorporate with early learning of story grammar elements (character, settings, initiating event, etc.) and pair with “Braidy” from Mindwingconcepts. Use thinking and speaking bubbles and have kids fill them in. What are the animals thinking, saying, etc. Mainly a wordless book, but lots of opportunity for speech production. For example, I have been using for syllable sequencing kiddos, and making up different sounds the animals make (appropriate for their targets) as they travel down the hills (i.e. wooogoooo, gaaaaaadeeeee, moooooowaaaa, etc.). You could do this with straight articulation targets too. The illustrations are great for working on simple prediction. What animal will be next? What will happen next? Have kids write a “sequel.” What would happen the next day? Would they try another winter sport? Would new animals join? Kids can draw their own pictures, could create on a story making app (i.e. Story Patch), use google images, etc. Please support books4all and order this book from our Amazon Store. Description: A rabbit has a bit more food than she needs for the winter. Soon she learns that sharing with others leads to a wonderful surprise. This sweet story is based upon a Chinese Fable. 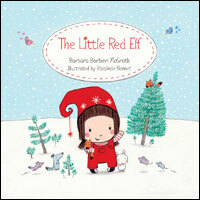 Why I like this story: A cute winter story. • identify all of the verbs in the story and use different tenses to tell the story. 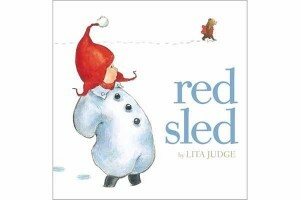 Description: Similar to Lita Judge’s winter story, Red Sled (see review here) a little girl leaves her red hat outside on the clothes line, and many forest animals decide to borrow it for some fun. However, when they return the hat…it isn’t the same. 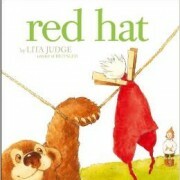 Why I like this story: A nice sequel to the Red Sled story, with wonderful illustrations as a mainly “wordless” book. A great story to “act out” in a group. Practice the “set up” of the play: assigning roles for the different animals, choosing objects to represent the house, the clothes line, the hat, the forest. Use thinking and speaking bubbles and have kids fill them in. What are the animals and the little girl thinking, saying, etc. A nice story to discuss simple problem solving. What did the girl do when she saw her hat ruined? Could be a nice discussion for staying “calm” when a problem arises, and working together as a team to fix the problem (as she and the animals knit the hat back together). Mainly a wordless book, but lots of opportunity for speech production. For example, I have been using for syllable sequencing kiddos, and making up different sounds the animals make (appropriate for their targets) as they “steal” the hat and play within the forest (i.e. wooogoooo, gaaaaaadeeeee, moooooowaaaa, etc.). You could do this with straight articulation targets too. I myself am not particularly crafty…however it seems a construction paper hat with red yarn and a pom pom could be a nice pairing with this story:) Could incorporate temporal markers throughout the steps, and direction following during the process. Why I like this story: Adorable pictures with lots of language opportunities. I’m a big fan of the original Little Red Hen, and this is a fun holiday spin. A good story for a group to stress “teamwork” and and “many hands make light the work” concept. A good message for this time of year as well. Have kids think about how they can help others…an obvious opportunity for some perspective taking. There is lots of opportunity to model, “Who will help me….” both for expressive and receptive “wh” question goals. Support books4all and order this book from Amazon.com . Thank you! 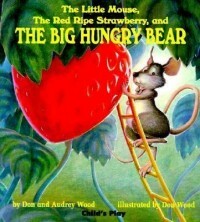 Description: A little mouse is thrilled that he finds a delicious strawberry, however, he hears that there is a big hungry bear who loves strawberries. Especially one that has just been picked…. The mouse is very expressive. A great story if working on emotions, and reading body language. Have children act out the mouse’s expressions and body language and/or guess yours. There is an emphasis on scared/worried as well as happy and relieved. Add “thinking bubbles” above the mouse and have children think about what he is thinking/feeling. As the mouse is trying to keep the strawberry from the bear, have children predict what he might do next? Will he hide under the rug? Under the bed? Turn it into pie? See if kids can think of new and different ways the mouse can hide or use the strawberry. Lots of opportunity for /s/ blends (strawberry, sniff, smell, etc.) Readers can read the story, non-readers can repeat. Description: Two friends spot a delicious apple hanging from a tree. The problem is they can’t get it unless they work together. A perfect simple story to act out. If in an individual session, read the story and pair with pretend play. If you have a toy pig and toy chick you’re all set. It’s a very simple sequence story so great for teaching pretend play sequences, incorporating dialogue, etc. If in a group/dyad, you can physically act out. There are 2 characters but also a couple ants that can be incorporated. Have kids come up with the props: what could be an apple, a tree, apple cores? Focus on the collaboration process, body language/facial expressions, etc. Create thinking and speaking bubbles for the characters in the story. What are they thinking/feeling? Why? Given the simple nature of the story great for early language concepts: simple verbs, agent + action, etc. For earlier narrative skills a great story to have kids “be the teacher” and retell the story encouraging temporal markers (first, next, then, etc.). Pair with the Story Patch App or other story retelling apps. Tie to curriculum: apples, planting seeds, composting, etc. Use sequencing cards to sequence these concepts, write sentences, etc. 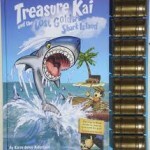 Description: An interactive book app OR available as a traditional book at TreasureKai.com but with interactive properties. 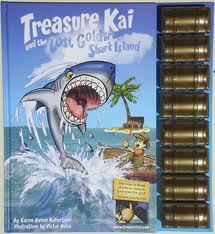 A young boy, Kai, embarks on a adventure to find lost treasure. Reasons I like this book: It reminds me of the “choose your own adventure” chapter book concept from my childhood. You get to choose how Kai finds the treasure. Story is great for comprehension. The story allows you to be read to, or read yourself. Use the story for prediction questions (what might happen next? ), “wh” questions, etc. When a riddle (clue) is provided, see if students can make guesses/infer what it could be? Why do they think that? Where might Kai go? What will he need to do? Play “I spy” with description questions when Kai is in the antique shop, his “secret hideaway.” Lots of objects. Focus on saliency- can they give you a clue with 2 important details about the object? The clues to finding the treasure are in riddle form. Have students predict which rhyming word is coming. For an activity after the book, have them generate their own treasure story and write their own riddles that rhyme to give a clue. Another good book to tie with “Braidy” through Mindwingconcepts. The “actions” that happen change order based on the route you choose. Have students retell. Kai demonstrates great body language. Have students imitate/interpret. The author also provides “reading strategies” tab on her site. The author was inspired by her children who were reluctant readers. She has tips and research here. Like this review and activities? Check out the Social Adventures App for more activities for children. Description: George gets into mischief again… and then saves the day again… in this relatively short episode of this classic series. Why I like this story: It is a classic and it is great for acting out in a group. 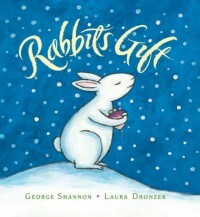 • while reading the story aloud, hide the pages with animals on them and ask kids to guess what animals George visits by describing them before showing the page. The animals pictured are excellent for a lesson in salience (what is the most important thing about a giraffe, kangaroo, elephant?). 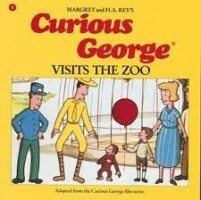 Have kids take turns describing which animal George might see next. • following the story, introduce a verbal description guessing game. For easy access to variety of objects presented by category, try our Bag Game app. • using the picture clues given in the story, ask kids to guess what George might do when the Man with the Yellow Hat asks him to stay put. • discuss the concepts of “guessing” vs “knowing”. Talk about why the picture clues lead to various “guesses” and why new information may lead to new guesses. • the illustrations in this book are excellent for talking about facial expressions and body language and reasons for them. • this is a great story for acting out or retelling either in individual sessions or in a group. For preschoolers, props can be provided to act out the sequence, while for K/1 kiddos, the simple story line offers a great opportunity to introduce Braidy, the Story Grammar Marker from Mindwing Concepts.